People from the Ryukyu Islands have the highest life expectancy in the world. The world’s oldest person, Misao Okawa, just turned 116 years old this month – she’s from Okinawa, the largest of the Ryukyu Islands of Japan. The Okinawa Program is based on the findings from a 25 year study of the people living in Okinawa. It outlines the traditional diet and lifestyle habits that scientists believe are responsible for the low risk of age associated diseases, long life expectancy rate, and overall high quality of health found there. While this book was written by researchers well over 10 years ago, interest in the Okinawa diet has been on the rise recently due to media attention. The traditional Okinawan diet is low-calorie, nutritionally dense, and full of antioxidants and flavonoids that boost immunity and support a healthy lifestyle. The Okinawa Program outlines a healthy diet as high in both complex carbs and fibre, and relatively low in fat, red meat, and calorie-dense food. You’ll eat lots of antioxidant-rich produce such as sweet potatoes and leafy greens, whole grains, tofu, seaweed, small servings of meat, and an average of three servings of fish a week. There are very low levels of saturated fat, sugar, salt, and refined grains, and virtually no eggs or dairy. There are dishes you’d expect, like miso soup, seaweed salad, and tofu with brown broccoli rice, but the program outlines plenty of other recipes with American, Italian, and Mexican flair. 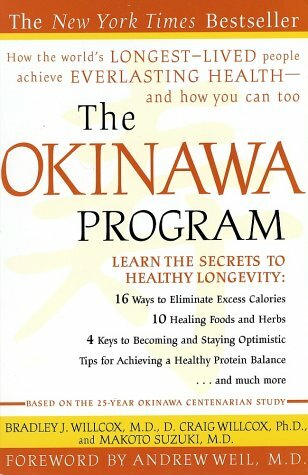 According to the authors of the book, the biggest benefit of following The Okinawa Program is its help in reducing the risk of cancer and giving you a higher quality of health. Studies from the National Institute on Aging have also shown that primates on a similar diet look younger, have leaner bodies, and demonstrate an improvement in mental clarity. If the long term promises aren’t enough to sell you on this diet, additional studies have shown a correlation between the traditional Okinawan diet and maintaining a healthy weight throughout life. While nobody can promise that you’ll live to be 100, there’s no doubt that The Okinawa Program can help clean up a diet by eliminating high-fat and processed foods. The book outlines a month long plan to revamp your current habits, but a healthy, sustainable lifestyle is a marathon, not a sprint. Incorporating staple foods and healthy habits from an Okinawan diet has been shown to improve the quality of life, but if you’re planning to diet for a month and revert back to unhealthy habits, then it’s unlikely that you’ll reap its benefits. You can buy The Okinawa Program from Amazon UK – currently priced at £9.60, and rated 4.5 out of 5 stars. Slimming Solutions are not affiliated with The Okinawa Program or any of it’s authors. Neither do we profit in any way from sales of the book. Credit: Lizzie Fuhr for POPSUGAR website. I don’t really have a comment, but I like this article. You should have a like button! I read this a few years ago – a great basis for healthy eating.